oh yeah~ he is legit! They should bench the 1st PP unit and just let the 2nd PP unit run things. Sutter touched it I think. DMcGrew wrote: Sutter touched it I think. 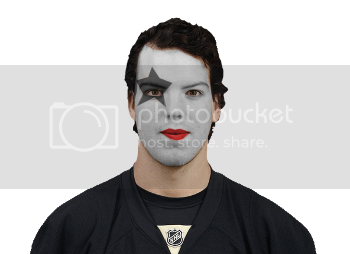 Thats why Despres ought to be on the number one PP. He shoots the puck! Don't think so but great screen and shot in both cases. Someone has to break it gently to netwolf that Chevalier is a terrible nickname. Refs letting this get out of control by not calling a blatant cross check on Clarkson and then calling that on Malkin. Has to be fair I guess in number of calls. I hate this league. So interfering with Malkin trying to enter the zone when Neal has the puck is OK, but not when Malkin does it. Got it. So hard keeping up with these post lockout rules. Gaucho wrote: Someone has to break it gently to netwolf that Chevalier is a terrible nickname. However, a great character in "Barry Lyndon."